Our heating systems use natural gas, which has become a battleground issue in NY because of hydrofracking. Greg & I have elected to heat with wood almost exclusively as part of our protest against the proposed lack of regulation in that industry. Also, as fossil fuels grow more expensive over the coming years, natural gas heat will become harder for all of us to afford. Wood heat is the simplest alternative to fossil fuels, so we can predict that many people will convert to wood as fossil fuel prices rise. Currently wood is readily available in our region, but as more people start using it we can expect its price to rise along with fossil fuel prices. We would like to plan ahead for this situation by establishing a coppice grove to supply firewood for Greg's home. Coppicing differs from conventional woodlot management in that trees are selected that will regrow from the root stumps after cutting. Each stump sends up several new shoots that will be allowed to mature to harvestable size and cut again. Trees that are managed in this way can regenerate indefinitely, and the established root system produces more rapid growth than replanting with seeds or saplings. * We would eventually become self-sufficient in meeting our heating needs. 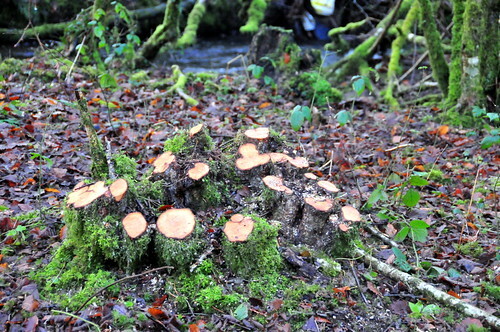 * We would develop expertise in coppice management for others to draw on. * A coppice grove would diversify our ecological environment. In England, where coppice groves have been established for millennia, they form a unique ecosystem that is distinct from either forest or meadow. * Woodlands provide a more stable climate than cleared areas. They are less affected by global warming, with the potential to diminish the impact of winter winds and summer heat and drought. * The grove will help to offset our carbon emissions. The standing biomass, even after we begin harvesting, will be much greater than what is currently present in the cleared areas, and the root systems will continue to grow. * Some firewood species also have other uses, such as food for humans or wildlife, wood for other uses, or living fences. How much firewood can a coppice grove produce? For a sustainably managed conventional woodlot, I've heard numbers ranging from half a cord to a cord of firewood per acre per year. Coppice groves are reputed to produce up to five times as much. If this productivity is actually realized, we should be able to heat Greg's house on half to one acre. However, younger trees may produce lower yields, and some trees may die due to weather extremes or pests or disease (such as emerald ash borer or oak blight.) We would like to allocate at least two acres, both as a buffer against potentially lower yields, and to make it possible to expand the grove to accommodate additional households. Sweet birch, river birch, red maple, silver maple, red oak, pin oak, white oak, swamp white oak, osage orange, crabapple, mountain ash, walnut, mulberry, wild black cherry, black locust, honeylocust, sycamore. This list may change as we learn more about the different species. Trees will be purchased from local and regional sources, for example the Tompkins County Soil and Water Conservation District annual tree sale, Musser Forests in Pennsylvania, or St. Lawrence Nursery. The grove should be accessible enough to manage and harvest, but away from areas that are most suitable for agriculture and orchards. We need a ready source of water for new saplings. We would like to use land that is likely to be retained in the event of a partial land sale. The spot that comes to mind is SW of the existing homes, in the meadow between the topsoil pile and the deer stand. In that location it could function as an extension of the permaculture belt, connecting the area around the village with the woods along the stream. One of the species we are considering is Osage Orange, which has a long history of use as a windbreak and living fence. Osage orange is a bear to work with because of its thorny nature, but it provides more heat per cord than any other wood, and it grows rapidly, coppices readily, and tolerates a wide range of soil types and weather conditions. We might want to establish a hedgerow of osage orange around the perimeter of the potential orchard site east of the parking lot, between it and the stream. We are willing to consider other suggestions. We would like to select a site and plant an initial group of trees this spring. We will add trees each year for the first decade, at which point the first group of trees should be ready to begin harvesting. Most trees will be harvested every 10 to 20 years, though kindling wood may be harvested more often. A question about your wood heater use: Do you match the size and kind of wood with the desired heat output? For instance, using small diameter softer woods in the spring and fall, and split harder woods in the winter? Also, are your houses made and used well enough to not require much supplemental heat? Best of luck brandishing your billhooks in the bush! I would go with black locust. It can't be beat in terms of BTU's. It's hot and burns a long time. Like coal. Although it can be a bit hard to start. It is one of the best nitrogen fixers and makes great honey via bees. My friend has planted a lot of them...all thornless. I would go with black locust. It can't be beat in terms of BTU's.